The 2017 Grammy Awards featured pop stars taking aim at Trump while elevating Beyoncé to a goddess-like status. It was a 2017 update of the elite’s agenda. All award shows contain carefully planned “highlight moments” to be discussed by mass media in the following days. The 2017 Grammys were no exception and, this year, these “moments” had a specific political message which clearly spelled out what the elite expects from people this year. At the moment, Trump can be likened to cartoonish ‘bad guy’, a racist, irrational, egocentric, intolerant, capitalist, patriarchal, misogynistic, incompetent tyrant who needs to be removed from power right away. Trump is the common enemy around which the nation’s youth can be rallied against. It is almost as if Trump is playing a role to “make the elite’s agenda cool again”. The elite’s motto is “Order after chaos”. Trump is the “chaos”. The elite’s agenda is the “order” to fix it. In the Grammys, the anti-Trump message reached its apex when Busta Rhymes took the stage and called Trump “Agent Orange” (which is also the name of a toxic herbicide used by the US army in Vietnam) – a perfectly cartoonish villain name. Opposed to Agent Orange was Beyoncé who played the role of an awe-inspiring mother-goddess, surrounded by an aura of purity. She was the queen of the ceremony and the recipient of universal praise. As in tradition, Beyoncé was the queen of this awards ceremony. While most artists offered sober performances, hers was an intense visual and auditory experience interlaced with powerful words and symbolic imagery. Shortly before the Grammy awards, Beyoncé made a grandiose pregnancy announcement which caused mass media to lose its damn mind. Some headlines were going to strange emotional depths, stating that “it was just what this nation needed”. A typical headline about Beyoncé. This mass media response was planned. Beyoncé’s team did everything right to make this moment as iconic and transcendent as possible. Strange fact, a Twitter user by the name of beyoncefan666 accurately predicted Beyoncé’s pregnancy announcement in July 2016. 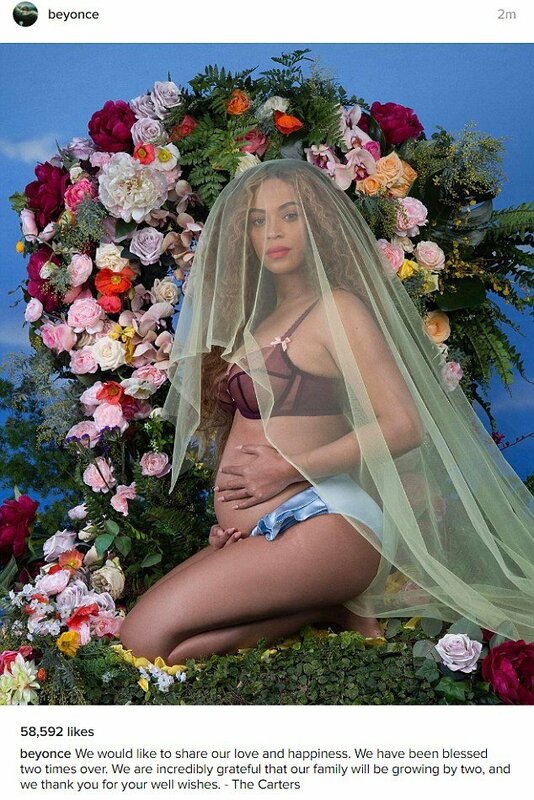 Media frenzy around Beyoncé’s pregnancy began when she posted an eye-catching picture on Instagram. Beyoncé’s pregnancy announcement on Instagram. While everybody and their mother were gossiping about this picture, nobody seemed to notice an extremely important item in there: The veil. Why is her face covered by a pale veil while announcing her pregnancy? Veils traditionally represent a bride’s virginity. By combining a symbol of virginity with her pregnant belly, we get a bizarre message about the babies being conceived without sexual relations – not unlike the Virgin Mary. 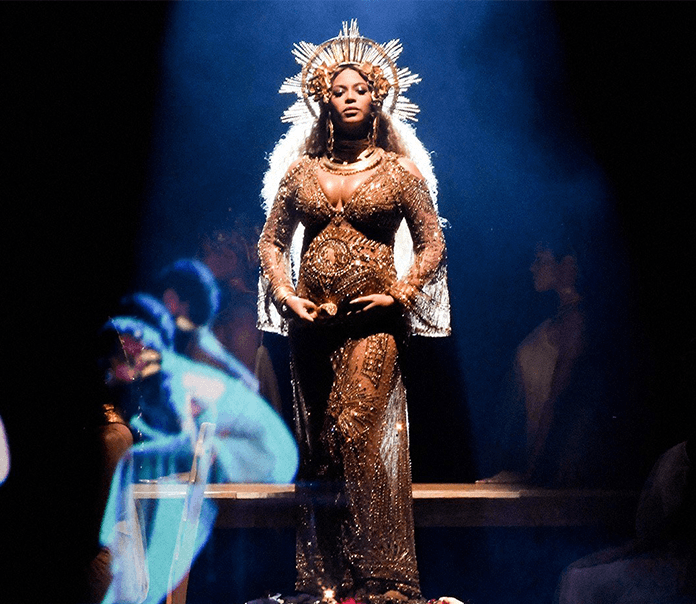 Beyoncé’s Grammy performance went even deeper into Virgin Mary symbolism while emphasizing the concept of immaculate conception.